The leopard (Panthera pardus), one of the world's most iconic big cats, has lost as much as 75 percent of its historic range, according to a paper published today in the scientific journal PeerJ. Conducted by partners including the National Geographic Society's Big Cats Initiative, international conservation charities the Zoological Society of London (ZSL) and Panthera and the International Union for Conservation of Nature (IUCN) Cat Specialist Group, this study represents the first known attempt to produce a comprehensive analysis of leopards' status across their entire range and all nine subspecies. The research found that leopards historically occupied a vast range of approximately 35 million square kilometers (13.5 million square miles) throughout Africa, the Middle East and Asia. Today, however, they are restricted to approximately 8.5 million square kilometers (3.3 million square miles). To obtain their findings, the scientists spent three years reviewing more than 1,300 sources on the leopard's historic and current range. The results appear to confirm conservationists' suspicions that, while the entire species is not yet as threatened as some other big cats, leopards are facing a multitude of growing threats in the wild, and three subspecies have already been almost completely eradicated. Lead author Andrew Jacobson, of ZSL's Institute of Zoology, University College London and the National Geographic Society's Big Cats Initiative, stated: "The leopard is a famously elusive animal, which is likely why it has taken so long to recognize its global decline. This study represents the first of its kind to assess the status of the leopard across the globe and all nine subspecies. Our results challenge the conventional assumption in many areas that leopards remain relatively abundant and not seriously threatened." In addition, the research found that while African leopards face considerable threats, particularly in North and West Africa, leopards have also almost completely disappeared from several regions across Asia, including much of the Arabian Peninsula and vast areas of former range in China and Southeast Asia. The amount of habitat in each of these regions is plummeting, having declined by nearly 98 percent. "Leopards' secretive nature, coupled with the occasional, brazen appearance of individual animals within megacities like Mumbai and Johannesburg, perpetuates the misconception that these big cats continue to thrive in the wild—when actually our study underlies the fact that they are increasingly threatened," said Luke Dollar, co-author and program director of the National Geographic Society's Big Cats Initiative. Philipp Henschel, co-author and Lion Program survey coordinator for Panthera, stated: "A severe blind spot has existed in the conservation of the leopard. In just the last 12 months, Panthera has discovered the status of the leopard in Southeast Asia is as perilous as the highly endangered tiger." Henschel continued: "The international conservation community must double down in support of initiatives —protecting the species. Our next steps in this very moment will determine the leopard's fate." Co-author Peter Gerngross, with the Vienna, Austria-based mapping firm BIOGEOMAPS, added: "We began by creating the most detailed reconstruction of the leopard's historic range to date. This allowed us to compare detailed knowledge on its current distribution with where the leopard used to be and thereby calculate the most accurate estimates of range loss. 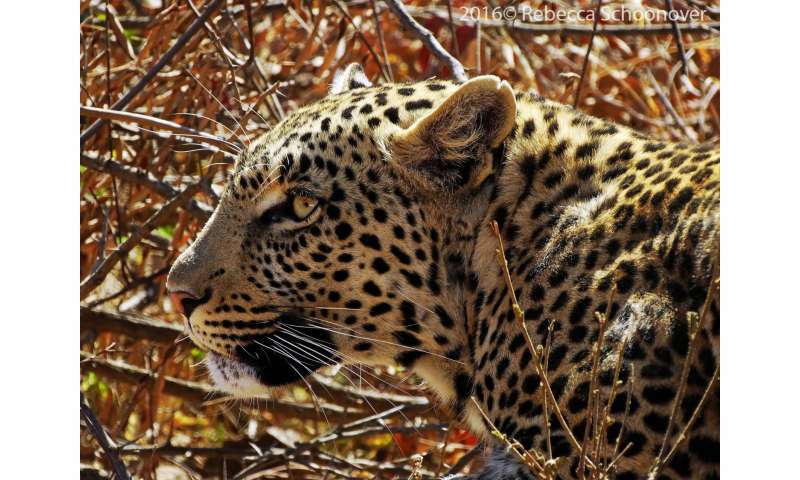 This research represents a major advancement for leopard science and conservation." Leopards are capable of surviving in human-dominated landscapes provided they have sufficient cover, access to wild prey and tolerance from local people. In many areas, however, habitat is converted to farmland and native herbivores are replaced with livestock for growing human populations. This habitat loss, prey decline, conflict with livestock owners, illegal trade in leopard skins and parts and legal trophy hunting are all factors contributing to leopard decline. Complicating conservation efforts for the leopard, Jacobson noted: "Our work underscores the pressing need to focus more research on the less studied subspecies, three of which have been the subject of fewer than five published papers during the last 15 years. Of these subspecies, one—the Javan leopard (P. p. melas)—is currently classified as critically endangered by the IUCN, while another—the Sri Lankan leopard (P. p. kotiya)—is classified as endangered, highlighting the urgent need to understand what can be done to arrest these worrying declines." Despite this troubling picture, some areas of the world inspire hope. Even with historic declines in the Caucasus Mountains and the Russian Far East/Northeast China, leopard populations in these areas appear to have stabilized and may even be rebounding with significant conservation investment through the establishment of protected areas and increased anti-poaching measures. "Leopards have a broad diet and are remarkably adaptable," said Joseph Lemeris Jr., a National Geographic Society's Big Cats Initiative researcher and paper co-author. "Sometimes the elimination of active persecution by government or local communities is enough to jumpstart leopard recovery. However, with many populations ranging across international boundaries, political cooperation is critical."